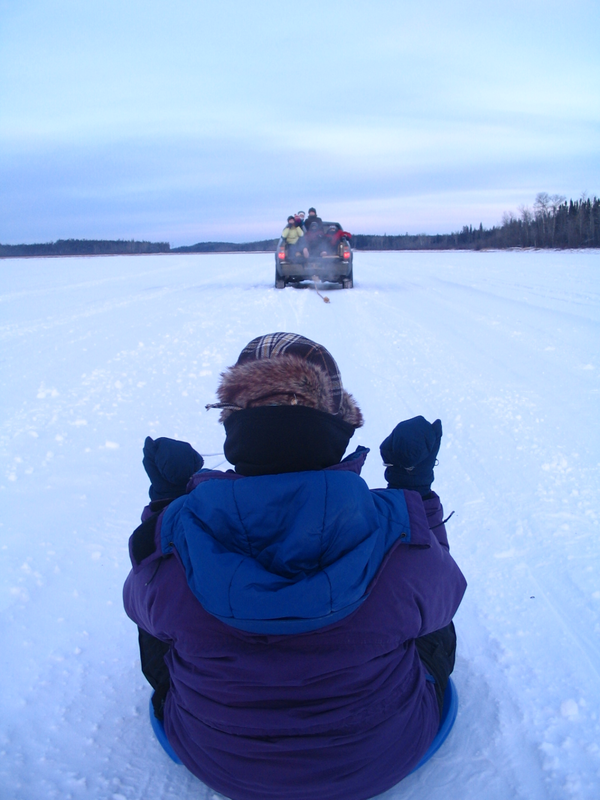 [Ice Roads to Pikwitonei, Northern Manitoba] In 2008, I brought a few friends home from college for the winter holidays. Coming from Brazil, Singapore and Yemen, none of them had seen snow before! It was such a treat for our family to welcome them into our home and share the joys of life in Northern Manitoba. Our "northern tourism" included a trip across the ice roads (a marvel in themselves!) while pulling a toboggan. On the drive home, we came across some ice fishers ... so of course we stopped and joined them. Here is my friend from Yemen, with her hijab stuffed under a toque, holding on tight as the vehicle starts to accelerate. Myself and my sisters cheering from the back of the truck!